Livestock production is the common denominator of trouble whether it's bison, elk, wolves, bears, water quality, grasslands health, or human health. Cattle are also the most obviously manageable element. One week from Monday, beginning November 15 and lasting through February 15, wild buffalo that migrate into Montana will likely be shot by hunters. Montana Fish, Wildlife & Parks are holding another hunt without habitat, a hunt for a species that is ecologically extinct in Montana. Forty-four State tags to kill bison have been issued for areas north and west of Yellowstone National Park, and if there is a normal winter migration, an additional 100 wild bison could be killed in this canned hunt. Montana's bison hunt is highly controversial. It is yet another tool Montana is using to stop wild bison from migrating into the state. This canned hunt does not replace hazing, capture and slaughter activities carried out under the Interagency Bison Management Plan, it is used in addition to it. Hunters who participate in Montana's bison hunt are being used by the Montana Department of Livestock as yet another tool of intolerance against native wild bison. At least two First Nations - the Nez Perce and the Confederated Salish-Kootenai Tribes - will also be hunting buffalo under treaty right, though their season will differ from that of Montana. In addition to our year-round presence in West Yellowstone, BFC will again be present near Gardiner on the north side of the Park. Our Gardiner camp will remain active for as long as the hunt is underway, or longer should the buffalo need us to stand witness. It is critical that we are able to be the eyes and ears for the buffalo in these locations where they migrate yet it is a huge financial challenge for us to do so. If you can help keep us on the front lines we will be better equipped to stand with the buffalo and share their story with the world. During the hunt, BFC will engage willing hunters in dialogue to talk about the threats wild bison face in Montana, and how they can help take a stand to restore this magnificent, gentle giant throughout it's native range. Since our last Update, brucellosis has made appearances in a few livestock herds, far from the current home range of America's last wild bison. Brucellosis is a bacteria that was brought to North America with the arrival of Eurasian cattle. While it hasn't been a significant human health issue since the advent of pasteurized dairy products and it hasn't been a threat to wildlife outside of livestock industry politics, brucellosis has been a driving force behind bad wildlife management decisions throughout the Yellowstone area, including the ongoing slaughter and harassment of the Yellowstone herds. Brucellosis has become a very convenient tool for livestock interests to use against wildlife, to maintain control over grasslands habitat. Livestock interests are always quick to place blame upon wildlife, rather than take responsibility for better managing livestock or even removing them from areas of critically important wildlife habitat. Despite these efforts, three cows from a Wyoming cattle ranch tested positive for brucellosis last week. It was just a matter of time as the cattle ranch is located near ill-conceived government-sponsored elk feeding grounds. Wildlife advocates have been trying to shut these feed lots down for many years but have been met with resistance by ranchers who favor them because it keeps wild elk off of native habitat currently occupied by cattle. Shortly after this news, Montana papers responded by announcing that they intend to capture and test up to 500 wild cow elk. We have warned that it would only be a matter of time before Montana livestock interests set their sites on elk in addition to buffalo. Lastly, just the other day, one of Ted Turner's domestic bison herds was found to have brucellosis. These bison, or beefalo, came from Turner's Bozeman-area Flying D Ranch, just a stone's throw from where the quarantined Yellowstone buffalo now reside on Turner's Green Ranch. There is absolutely no chance that the quarantined buffalo, stolen from Yellowstone when they were wild calves, are the source of infection. These incidences are more critical bits of evidence that wild buffalo are not the source of brucellosis transmissions to livestock. 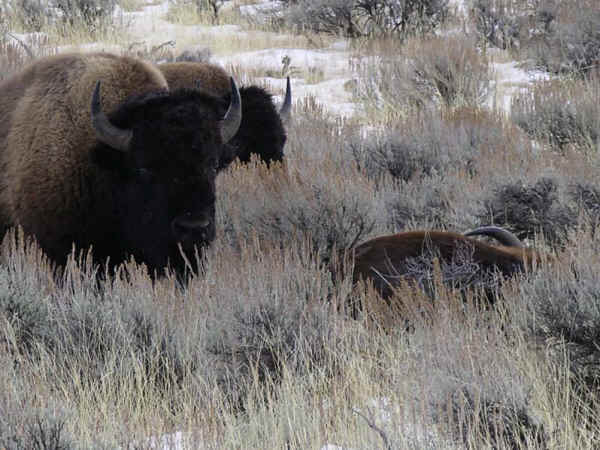 There has never been a single documented case of wild bison transmitting brucellosis to cattle, even during the decades prior to the heavy-handed tactics carried out under the Interagency Bison Management Plan. In the Greater Yellowstone Ecosystem, the combined governments of Wyoming, Idaho, and Montana--along with the U.S. Government--are wasting taxpayer money by focusing on containing the natural migration of wild buffalo. Phasing out Wyoming's feed grounds and acquiring habitat for bison and elk would be far more effective use of taxpayer money. Livestock production is the common denominator of trouble whether it's bison, elk, wolves, bears, water quality, grasslands health, or human health. Cattle are also the most obviously manageable element; the only reasonable solution is to shift the focus on controlling them and ensuring that they are not a threat to our wildlife and wild places.